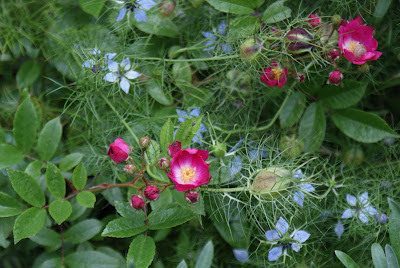 As I type a small posy of sweet-peas are keeping me company with their scent. 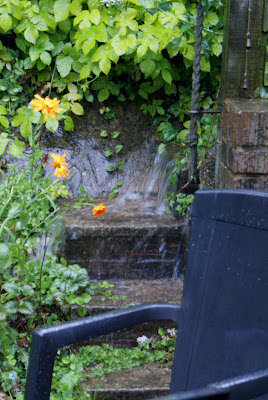 Outside, what promised to be a fine day earlier is clouding over, yet more rain on the way. I'm just back from the allotment. This year, I was determined to make it the most productive year so far but, despite my best efforts, all I have succeeded in is raising a bumper crop of slugs and snails. It is just energy sapping to see all the damage this year's rain has done. Garlic, courgettes and cauliflowers have all disappeared without a trace. I'm down to two and half remaining squash plants. A few broad beans, climbing French beans, sweetcorn and peas are hanging on in there against the torrential rain and the potatoes are leggy and non-flowering, glowering at me from their muddy rows. The onions, such a good crop last year, are rotten. Only the rhubarb and the sweet-peas seem really happy. I console myself with the thought of the early strawberry glut, now in the freezer, and the hope that, should we ever get drier, warmer weather, I can indulge in some strawberry ice-cream making. In the garden, the weeds and grass have loved this weather, along with the slugs and snails they are having a fantastic time. The jasmine and the buddleja are just starting to flower but the ominous lack of bees, crickets and butterflies makes for an oddly quiet time of year. Only the blackbirds seem happy, having a field day out on the soft, wet lawn. I have resolved today not to fret any more over this washout summer. Now is the time to plan for winter. Clear back the jungle growth, blame it on a freaky jet stream and think about autumn sowing. 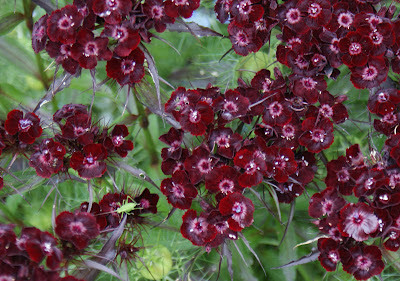 Torrential rain in the garden over weekend, rose 'Marjorie Fair' and nigella, sweet william and cricket, weed seed head.